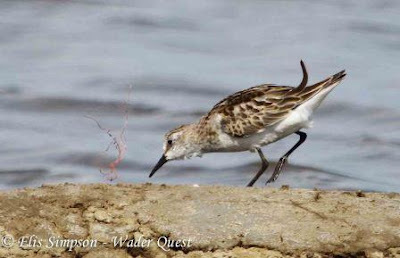 Wader Quest: Unusual stint at Pak Thale in Thailand. ID conundrum. 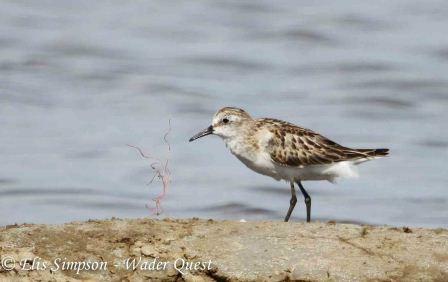 Unusual stint at Pak Thale in Thailand. ID conundrum. When Elis and I were in Thailand we spent some time looking at the stints and this bird stood out among them as looking different. We didn't have time to study it at the time so I asked Elis to get some record shots of it. So, for a bit of fun, for those of you who like a conundrum, what is this bird? 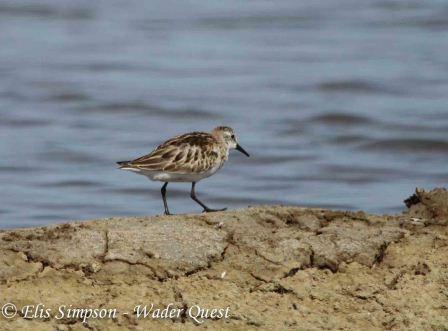 Red-necked or Little Stint? ... BUT... Tony Prater had this to say about this bird, and frankly who am I to argue? Slightly confusing bird but I think that on balance it is a Red-necked. 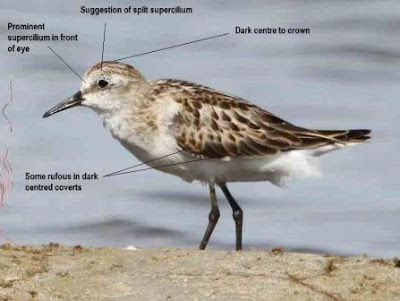 Upperparts - dark and with little signs of pale mantle lines (there is a very small hint but essentially that is in the range of RNS), characteristic of just pre-moult whereas I'd still expect very obvious lines in LS with that amount of juvenile upperparts. Bill - distinctly deep based and I'd have said deeper than LS even though a subjective character. 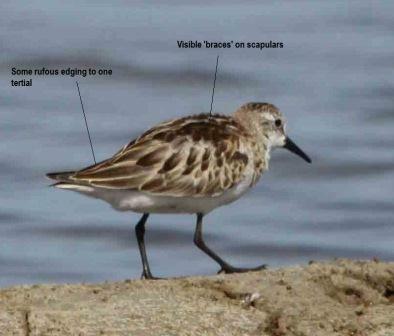 Scapulars - the anterior lower scaps look to have palish bases and a dark oval towards the tip; quite difficult to be certain about this as the feathers are unusually very disarranged. That could make it closer to RNS as the whole of the centre of the lower scapulars tends to be dark in LS. Tertials - (and this I think is the clincher) are clearly narrowly fringed with whitish to off white; a LS in a similar juvenile plumage, would have rather broader and noticeably rufous edges to the tertials. but nevertheless an interesting bird! So there you have it! I'm glad he said it was confusing, I don't feel so bad. Thanks to Tony Prater for his time and expertise and to Don Taylor for putting us in touch. Thanks digdeep. I will send you said photos via email. I'd be interested to hear your opinion, especially as it agrees with me LOL.